My so-called emergency knitting is now well past the point where it can be taken anywhere easily: this close to the cuff, for which I have to cart around a contrast yarn, both socks need too much trying on and measuring. Instead I'm keeping them on the kitchen counter so I can knit while waiting for water to boil. 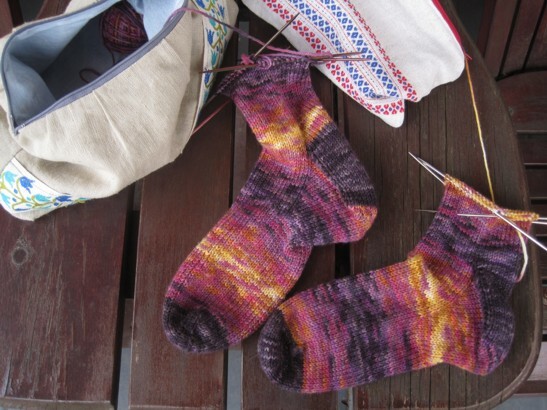 Do you knit while you're cooking? It's possibly not a good idea. I've burned more grilled cheese sandwiches than I can count either by wandering off to to the computer to look up some little detail or by forgetting how many rounds I've done since the last check of the pan. Last weekend I made pancakes, which is definitely not a good candidate for this kind of multitasking. Not only is it even easier to burn a pancake than a grilled cheese sandwich, you've got all that batter in a big messy mixing bowl just sitting on the counter waiting for the ball of yarn to leap out of its own bowl (a frequent consequence of my habitual yanking of a length of yarn to ensure relaxed tension) and into it. After a couple of narrow escapes, I decided that I should at least move the yarn bowl to an adjacent counter. 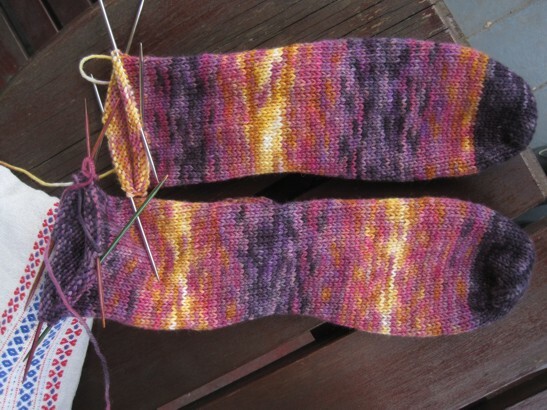 These socks are perfect for kitchen knitting otherwise, though. The heavier-weight yarn is easy to work with under distraction-laden conditions, I don't have to look at straight stocking stitch but can keep my eye on the stove, and the limited number of stitches per needle give me lots of good stopping points when something needs flipping. And then of course there are the comfy moments in an armchair when you have to wait 10 minutes for the timer to go before you do the next part of the meal. I will be sad to see these go now that they are nearly done, but I would be gladder if they were done now so I could wear them, oh, I don't know, tomorrow? While it is still freezing out. Seriously, the late snowstorm we had yesterday has brought the temperatures right back down to frigid. It is downright weird to be shoveling out a fall at 7:45 pm and still have close to broad daylight, which makes me think we don't usually have a big snow after the spring episode of Daylight Saving Time. And when I say 'usually', I mean 'ever'. They're pretty determined to be fraternal socks aren't they. Perfect consistency, in which the perfectionist and symmetrical-focused me will have to take comfort. I'm sorry I can't photograph the soft though. They are 100% squish. Yep, I should really get these finished up and on my feet, don't you think? I do much of my sock knitting while cooking. Which is why someone else now usually has to empty the dishwasher after I've been in the kitchen for half a day. Ad then I know where they are when they need to be grabbed for the car. Perfect, right? And who needs counter space? I bought the companion Lightning with my Valkyrie- they're all beautiful!